TP Tiling for a professional Tiling job on walls, floors, kitchens, bathrooms & conservatories. Doors made to measure and worksurfaces supplied and fitted. Focus DIY Store in Aldridge At FOCUS we offer four great products to help with all your home improvement needs. Why wait when you can have what you need today? Take advantage of our Focus Account card Check in-store for special extended credit options. Get discount off all your purchases for six months if you have just moved house or every Tuesday if you are Over 60. Barons Court Ind Est. Every Avanti kitchen and bedroom is individually designed and crafted to satisfy customers requirements in our own factory. 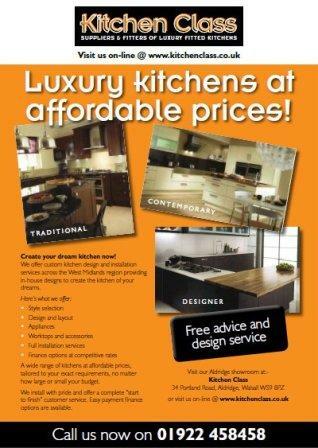 Create your dream kitchen now! We offer custom kitchen design and installation services across the West Midlands region providing in-house designs to create the kitchen of your dreams.